For other uses, see Mayo (disambiguation). County Mayo (Irish: Contae Mhaigh Eo, meaning "Plain of the yew trees") is a county in Ireland. In the West of Ireland, in the province of Connacht, it is named after the village of Mayo, now generally known as Mayo Abbey. Mayo County Council is the local authority. The population was 130,507 at the 2016 census. The boundaries of the county, which was formed in 1585, reflect the Mac William Íochtar lordship at that time. "God and Mary be with us"
It is bounded on the north and west by the Atlantic Ocean; to the south by County Galway; the east by County Roscommon; and the northeast by County Sligo. Mayo is the third-largest of Ireland's 32 counties in area and 15th largest in terms of population. It is the second-largest of Connacht’s five counties in both size and population. Mayo is located along the west coast of Ireland which is approximately 7,400 km in length. There is a distinct geological difference between the west and the east of the county. The west consists largely of poor subsoils and is covered with large areas of extensive Atlantic blanket bog, whereas the east is largely a limestone landscape. Agricultural land is therefore more productive in the east than in the west. Mayo has Ireland's highest cliffs at Croaghaun, Achill Island, while the Benwee Head cliffs in Kilcommon Erris drop almost perpendicularly 900 feet (270 m) into the Atlantic Ocean. Mayo County Council (Irish: Comhairle Contae Mhaigh Eo) is the authority responsible for local government. As a county council, it is governed by the Local Government Act 2001. The County is divided into four municipal areas Castlebar, Ballina, Claremorris and West (an area which stretches from Westport to Belmullet). The council is responsible for housing and community, roads and transportation, urban planning and development, amenity and culture, and environment. For the purpose of local elections the county is divided into its four municipal districts, replacing the former six local electoral areas: Ballina (6), Belmullet (4), Castlebar (7), Claremorris (6), Swinford (4) and Westport (4). The county town is at Áras an Contae in Castlebar, the main population centre located in the centre of the county. For national elections, half of the Claremorris Municipal District is in Galway West, and stretches from Ashford Castle to Ireland West Airport. Costello (east-south-east, containing Kilkelly Ballyhaunis) etc. Castlebar and Ballina are the two most populous towns in the county, 12,318 in Castlebar located at the centre of the county and 10,361 (11,086 including environs) in Ballina located at the north-east of corner of the county. These are followed by Westport, which has 5,543 residents and Claremorris, with a population of 3,412 in the 2011 census returns. A survey of the terrestrial and freshwater algae of Clare Island was made between 1990 and 2005 and published in 2007. A record of Gunnera tinctoria is also noted. Consultants working for the Corrib gas project have carried out extensive surveys of wildlife flora and fauna in Kilcommon Parish, Erris between 2002 and 2009. This information is published in the Corrib Gas Proposal Environmental impact statements 2009 and 2010. County Mayo has a long history and prehistory. At Belderrig on the north Mayo coast, there is evidence for Mesolithic (Middle Stone Age) communities around 4500 cal. BC., while throughout the county there is a wealth of archaeological remains from the Neolithic (New Stone Age) period (ca. 4,000 BC to 2,500 BC), particularly in terms of megalithic tombs and ritual stone circles. The first people who came to Ireland – mainly to coastal areas as the interior was heavily forested – arrived during the Middle Stone Age, as long as eleven thousand years ago. Artefacts of hunter/gatherers are sometimes found in middens, rubbish pits around hearths where people would have rested and cooked over large open fires. Once cliffs erode, midden-remains become exposed as blackened areas containing charred stones, bones, and shells. They are usually found a metre below the surface. Mesolithic people did not have major rituals associated with burial, unlike those of the Neolithic (New Stone Age) period. The Neolithic period followed the Mesolithic around 6,000 years ago. People began to farm the land, domesticate animals for food and milk, and settle in one place for longer periods. The people had skills such as making pottery, building houses from wood, weaving, and knapping (stone tool working). The first farmers cleared forestry to graze livestock and grow crops. In North Mayo, where the ground cover was fragile, thin soils washed away and blanket bog covered the land farmed by the Neolithic people. Extensive pre-bog field systems have been discovered under the blanket bog, particularly along the North Mayo coastline in Erris and north Tyrawley at sites such as the Céide Fields, centred on the north east coast. The Neolithic people developed rituals associated with burying their dead; this is why they built huge, elaborate, galleried stone tombs for their dead leaders, known nowadays as megalithic tombs. There are over 160 recorded megaliths in County Mayo, such as Faulagh. There are four distinct types of Irish megalithic tombs—court tombs, portal tombs, passage tombs and wedge tombs—examples of all of which can be found in County Mayo. Areas particularly rich in megalithic tombs include Achill, Kilcommon, Ballyhaunis, Moygownagh, Killala and the Behy/Glenurla area around the Céide Fields. Megalithic tomb building continued into the Bronze Age when metal began to be worked for tools alongside the stone tools. The Bronze Age lasted approximately from 4,500 years ago to 2,500 years ago (2,500 BC to 500 BC). Archaeological remains from this period include stone alignments, stone circles and fulachta fiadh (early cooking sites). They continued to bury their chieftains in megalithic tombs which changed design during this period, more being of the wedge tomb type and cist burials. Around 2,500 years ago the Iron Age took over from the Bronze Age as more and more metalworking took place. This is thought to have coincided with the arrival of Celtic speaking peoples and the introduction of the ancestor of Irish. Towards the end of this period, the Roman Empire was at its height in Britain but it is not thought that the Roman Empire extended into Ireland to any large degree. Remains from this period, which lasted until the Early Christian period began about AD 325 (with the arrival of St. Patrick into Ireland, as a slave) include crannógs (Lake dwellings), promontory forts, ringforts and souterrains of which there are numerous examples across the county. The Iron Age was a time of tribal warfare with kingships, each fighting neighbouring kings, vying for control of territories and taking slaves. Territories were marked by tall stone markers, Ogham stones, using the first written down words using the Ogham alphabet. The Iron Age is the time period in which the tales of the Ulster Cycle and sagas took place. The Táin Bó Flidhais which took place mainly in Erris sets the scene well. Christianity came to Ireland around the start of the 5th century. It brought many changes including the introduction of writing and recording events. The tribal 'tuatha' and the new religious settlements existed side by side. Sometimes it suited the chieftains to become part of the early Churches, other times they remained as separate entities. St. Patrick (4th century) may have spent time in County Mayo and it is believed that he spent forty days and forty nights on Croagh Patrick praying for the people of Ireland. From the middle of the 6th century hundreds of small monastic settlements were established around the county. Some examples of well-known early monastic sites in Mayo include Mayo Abbey, Aughagower, Ballintubber, Errew Abbey, Cong Abbey, Killala, Turlough on the outskirts of Castlebar, and island settlements off the Mullet Peninsula like the Inishkea Islands, Inishglora and Duvillaun. In 795 the first of the Viking raids took place. The Vikings came from Scandinavia to raid the monasteries as they were places of wealth with precious metal working taking place in them. Some of the larger ecclesiastical settlements erected round towers to prevent their precious items being plundered and also to show their status and strength against these pagan raiders from the north. There are round towers at Aughagower, Balla, Killala, Turlough and Meelick. The Vikings established settlements which later developed into towns (Dublin, Cork, Wexford, Waterford etc..) but none were in County Mayo. Between the reigns of Kings of Connacht Cathal mac Conchobar mac Taidg (973–1010) and Tairrdelbach Ua Conchobair (1106–1156), various tribal territories were incorporated into the kingdom of Connacht and ruled by the Siol Muirdaig dynasty, based initially at Rathcroghan in County Roscommon, and from c. 1050 at Tuam. The families of O'Malley and O'Dowd of Mayo served as admirals of the fleet of Connacht, while families such as O'Lachtnan, Mac Fhirbhisigh, and O'Cleary were ecclesiastical and bardic clans. In AD 1169 when one of the warring kings in the east of Ireland, Dermot MacMurrough, appealed to the King of England for help in his fight with a neighbouring king, the response was the arrival of the Anglo-Norman colonisation of Ireland. County Mayo came under Norman control in AD 1235. Norman control meant the eclipse of many Gaelic lords and chieftains, chiefly the O'Connors of Connacht. During the 1230s, the Anglo-Normans and Welsh under Richard Mór de Burgh (c. 1194 – 1242) invaded and settled in the county, introducing new families such as Burke, Gibbons, Staunton, Prendergast, Morris, Joyce, Walsh, Barrett, Lynott, Costello, Padden and Price, Norman names are still common in County Mayo. Following the collapse of the lordship in the 1330s, all these families became estranged from the Anglo-Irish administration based in Dublin and assimilated with the Gaelic-Irish, adopting their language, religion, dress, laws, customs and culture and marrying into Irish families. They "became more Irish than the Irish themselves". The most powerful clan to emerge during this era were the Mac William Burkes, also known as the Mac William Iochtar (see Burke Civil War 1333–1338), descended from Sir William Liath de Burgh, who defeated the Gaelic-Irish at the Second Battle of Athenry in August 1316. They were frequently at war with their cousins, Clanricarde of Galway, and in alliance with or against various factions of the O'Conor's of Siol Muiredaig and O'Kelly's of Uí Maine. The O'Donnell's of Tyrconnell regularly invaded in an attempt to secure their right to rule. The Anglo Normans encouraged and established many religious orders from continental Europe to settle in Ireland. Mendicant orders—Augustinians, Carmelites, Dominicans and Franciscans began new settlements across Ireland and built large churches, many under the patronage of prominent Gaelic families. Some of these sites include Cong, Strade, Ballintubber, Errew Abbey, Burrishoole Abbey and Mayo Abbey. During the 15th and 16th centuries, despite regular conflicts between them as England chopped and changed between religious beliefs, the Irish usually regarded the King of England as their King. When Elizabeth I came to the throne in the mid-16th century, the English people, as was customary at that time, followed the religious practices of the reigning monarch and became Protestant. Many Irish people such as Gráínne O'Malley, the famous pirate queen, had close relationships with the English monarchy, and the English kings and queens were welcome visitors to Irish shores. The Irish however, generally held onto their Catholic religious practices and beliefs. The early plantations of settlers in Ireland began during the reign of Queen Mary in the mid-16th century and continued throughout the long reign of Queen Elizabeth I until 1603. By then the term County Mayo had come into use. In the summer of 1588 the galleons of the Spanish Armada were wrecked by storms along the west coast of Ireland. Some of the hapless Spaniards came ashore in Mayo, only to be robbed and imprisoned, and in many cases slaughtered. Almost all the religious foundations set up by the Anglo Normans were suppressed in the wake of the Reformation in the 16th century. Protestant settlers from Scotland, England, and elsewhere in Ireland, settled in the County in the early 17th century. Many would be killed or forced to flee because of the 1641 Rebellion, during which a number of massacres were committed by the Catholic Gaelic Irish, most notably at Shrule in 1642. A third of the overall population was reported to have perished due to warfare, famine and plague between 1641 and 1653, with several areas remaining disturbed and frequented by Reparees into the 1670s. Pirate Queen Gráinne O'Malley is probably the best known person from County Mayo between the mid-16th century and the turn of the 17th century. In the 1640s, when Oliver Cromwell overthrew the English monarchy and set up a parliamentarian government, Ireland suffered severely. With a stern regime in absolute control needing to pay its armies and friends, the need to pay them with grants of land in Ireland led to the 'to hell or to Connaught' policies. Displaced native Irish families from other (eastern and southern mostly) parts of the country were either forced to leave the country, often as slaves, or (if they had been well behaved and compliant with the orders of the parliamentarians) awarded grants of land 'west of the Shannon' and put off their own lands in the east. The land in the west was divided and sub-divided between more and more people as huge estates were granted on the best land in the east to those who best pleased the English. Mayo does not seem to have been affected much during the Williamite War in Ireland, though many natives were outlawed and exiled. For the vast majority of people in County Mayo the 18th century was a period of unrelieved misery. Because of the penal laws, Catholics had no hope of social advancement while they remained in their native land. Some, like William Brown (1777–1857), left Foxford with his family at the age of nine and thirty years later was an admiral in the fledgling Argentine Navy. Today he is a national hero in that country. The general unrest in Ireland was felt just as keenly across Mayo, and as the 18th century approached and news reached Ireland about the American War of Independence and the French Revolution, the downtrodden Irish, constantly suppressed by Government policies and decisions from Dublin and London, began to rally themselves for their own stand against English rule in their country. By 1798 the Irish were ready for rebellion. The French came to help the Irish cause. General Humbert, from France landed in Killala with over 1,000 officers where they started to march across the county towards Castlebar where there was an English garrison. Taking them by surprise Humbert's army was victorious. He established a 'Republic of Connacht' with one of the Moore family from Moore Hall near Partry. Humbert's army marched on towards Sligo, Leitrim and Longford where they were suddenly faced with a massive English army and were forced to surrender in less than half an hour. The French soldiers were treated honourably, but for the Irish the surrender meant slaughter. Many died on the scaffold in towns like Castlebar and Claremorris, where the high sheriff for County Mayo, the Honourable Denis Browne, M.P., brother of Lord Altamont, wreaked a terrible vengeance – thus earning for himself the nickname which has survived in folk memory to the present day, 'Donnchadh an Rópa' (Denis of the Rope). In the 18th century and early 19th century, sectarian tensions arose as evangelical Protestant missionaries sought to 'redeem the Irish poor from the errors of Popery'. One of the best known was the Rev. Edward Nangle's mission at Dugort in Achill. These too were the years of the campaign for Catholic Emancipation and, later, for the abolition of the tithes, which a predominately Catholic population was forced to pay for the upkeep of the clergy of the Established (Protestant) Church. During the early years of the 19th century, famine was a common occurrence, particularly where population pressure was a problem. The population of Ireland grew to over eight million people prior to the Irish Famine (or Great Famine) of 1845–47. The Irish people depended on the potato crop for their sustenance. Disaster struck in August 1845, when a killer fungus (later diagnosed as Phytophthora infestans) started to destroy the potato crop. When widespread famine struck, about a million people died and a further million left the country. People died in the fields from starvation and disease. The catastrophe was particularly bad in County Mayo, where nearly ninety per cent of the population depended on the potato as their staple food. By 1848, Mayo was a county of total misery and despair, with any attempts at alleviating measures in complete disarray. There are numerous reminders of the Great Famine to be seen on the Mayo landscape: workhouse sites, famine graves, sites of soup kitchens, deserted homes and villages and even traces of undug 'lazy-beds' in fields on the sides of hills. Many roads and lanes were built as famine relief measures. There were nine workhouses in the county: Ballina, Ballinrobe, Belmullet, Castlebar, Claremorris, Killala, Newport, Swinford and Westport. A small poverty-stricken place called Knock, County Mayo, made headlines when it was announced that an apparition of the Blessed Virgin Mary, St. Joseph and St. John had taken place there on 21 August 1879, witnessed by fifteen local people. A national movement was initiated in County Mayo during 1879 by Michael Davitt, James Daly, and others, which brought about the greatest social change ever witnessed in Ireland. Michael Davitt, a labourer whose family had moved to England joined forces with Charles Stewart Parnell to win back the land for the people from the landlords and stop evictions for non payment of rents. A new word came into the English language through an incident that occurred in Mayo. An English landlord called Captain Charles Cunningham Boycott could get no workers to do anything for him, so unpleasant as he was to them, so he brought in Protestant workers from elsewhere. He spent so much on security and protection for them that his harvest cost him a fortune and also nobody in the area would serve him in shops, or deal with him. This ostracisation became known as "boycotting" and Captain Boycott was left with no option but to leave Mayo and take his family with him to England. The "Land Question" was gradually resolved by a scheme of state-aided land purchase schemes. The tenants became the owners of their lands under the newly set-up Land Commission. A Mayo nun, Mother Agnes Morrogh-Bernard (1842–1932), set up the Foxford Woollen Mill in 1892. She made Foxford synonymous throughout the world with high quality tweeds, rugs and blankets. Mayo has remained an essentially rural community to the present day. 1458. Mac William Burk, i.e. Edmond, died. 1469. A hosting by O'Domhnaill, i.e. Aedh Ruadh, into Lower Connacht, and their hostages were received by him; and he took the army of Lower Connacht with him towards Mac William Burk; and they all went from thence to Clann-Rickard, and the Machaire riabhach, and Baile-an chláir, i.e. Mac William's town, were burned by them. Mac William and O'Briain came with them, and the son of O'Conchobhair of Corcumruaidh was slain by them; and O'Domhnaill went home with triumph. 1476. O'hUiginn, i.e. Brian, son of Ferghal Ruadh, head of the schools of Erinn and Alba, died this year. 1478. Great wind in this year, soon after Christmas. 1485. The defeat of the Muaidh was given by O'Domhnaill, i.e. Aedh Ruadh, to the Foreigners and Gaeidhel of the province of Connacht. 1488. Maelmuire, son of Tadhg Og O'hUiginn, an eminent poet, died this year. 1494. The son of Mac William Burk was slain this year near the castle of Sligech, i.e. William, son of Rickard, son of Edmond, son of Thomas Burk. 1496. O'Dubhda, Dubh, i.e. William, the son of Domhnall Ballach, died. 1497. Great famine throughout Erinn in hoc anno. 1499. Cormac, son of Domhnall, son of Brian O'hUiginn, was violently killed with one shot of an arrow by the Clann-Feorais this year. Richard Og, son of Richard O'Cuairsceith, was killed on the same day, i.e. the Wednesday after Whitsuntide. 1502. Domhnall, son of Brian O'hUiginn, tutor of the schools of Erinn in poetry, died in hoc anno. 1503. The defeat of Bel-atha-na-ngarbhán was given by Rickard Burk and his kinsmen to Mac William Iochtair and the Mainechs, in which Ruaidhri Mor Mac Suibhne was slain. 1512. A great war between O'Domhnaill, i.e. Aedh, and O'Neill, i.e. Art, son of Aedh; and a war between O' Domhnaill and Mac William Burk, i.e. Edmond, son of Rickard. O'Domhnaill retains fifteen hundred axes in Tir-Conaill, and in the province of Connacht, and in Feara-Manach. O'Domhnaill proceeds from Doire with a small band, and takes the castle of Bel-in-chláir on the borders of Luighne and Gaileng; and he leaves warders in it, and goes back into Tir-Fhiachrach. Mac William Burk musters his army, and lays siege to the town. And on hearing this O' Domhnaill advances again towards the town, and Mac William leaves the place, and goes to put provisions and warders into the castle of Eiscir-abhann in Tir-Fhiachrach. 1513. Eoghan O'Maille was slain this year in Tir-Boghaine, with the crews of three ships. 1514. Great depredations were committed by O'Domhnaill in Gailenga, on which occasion he burned and plundered the country as far as Cruachan-Gaileng; and Ó Ruadháin is killed there by him, and a great many more along with him. 1519. A rainy, truly wet, summer and harvest this year; it was a hard, tormenting year, and a year of suffering and sickness. 1520. A great plague in the beginning of this year in Erinn. Mac William Burk, i.e. Meiler the son of Tibbot, was killed per dolum by the sons of Seoinín Mor, son of Mac Seoinín.William, son of William Mac Siurtán, mortuus est. 1523. O'Maille, i.e. Cormac, son of Eoghan O'Maille, general supporter of the hospitality and nobility of the west of Connacht, mortuus est. Domhnall, son of Thomas O'Maille, assumed his place. 1524. Great inclemency of weather, and mortality of cattle, in the beginning of the year. 1528. Great wind in this year, the Friday before Christmas, which threw down a great many wooden and stone buildings, and several trees; and it broke down, in particular, the monastery of Dún-na-nGall; and it shattered and blew away a great number of boats on sea and land. 1532. The castle of Ard-na-riadh was taken by the sons of O'Dubhda against the son of John Burk; and a war broke out between themselves and the descendants of Rickard Burk, and many depredations and homicides were committed between them, in hoc anno. 1533. The castle of Ard-na-riadh was taken by the sons of Thomas Burk from the sons of O'Dubhda, in the night, in like manner. 1536. This year was a sickly, unhealthy year, in which numerous diseases, viz., a general plague, and small-pox, and a flux-plague, and the bed-distemper, prevailed excessively. Mac David, i.e. Thomas, son of David, son of Edmond, died in hoc anno. Mac Goisdelbh, i.e. John Dubh, died in hoc anno. 1536. Thomas O'hUiginn, i.e. the tutor of the men of Erinn and Alba in poetry, died this year. The chieftains of Lower Connacht, viz., Tadhg Og, the son of Tadhg, son of Aedh, and Tadhg the son of Cathal Og O'Conchobhair, and the Clann-Donnchadha, and the sons of O'Dubhda, went against the descendants of Richard Burk, at the instigation of the Bishop Barrett. And the herds of the country went before them to the termon of Oiremh, and the bishop followed them upon the termon, and brought the herds to the army; and restitution was not given by them in honour of saint or sanctuary. 1536. Mac Goisdelbh, i.e. John, son of the Gilla-dubh, a generous, humane man, and a good captain, was killed by Piers Mac Goisdelbh, and by some of the people of Airtech, in hoc anno. 1537. A hosting by O'Domhnaill, i.e. Maghnus, into Lower Connacht, in the middle month of Autumn, on which occasion he destroyed much corn, and burned and traversed Lower Connacht, viz., Tir-Fiachrach, and Cairbre, and the two Luighne, and the Corann, and Tir-Oilella, on his way northwards. And O'hEghra Riabhach's town is taken by him on this occasion; and he gave protection to O'hEghra himself, on condition of submitting to his power, and carried him off in captivity. The county has experienced perhaps the highest emigration out of Ireland. In the 1840s–1880s, waves of emigrants left the rural townlands of the county. Initially triggered by the Great Famine and then in search of work in the newly industrialising United Kingdom and the United States, the population fell considerably. From 388,887 in 1841, the population fell to 199,166 in 1901. The population reached a low of 109,525 in 1971 as emigration continued. Emigration slowed down as the Irish economy began to expand in the 1990s and early 2000s. Consequently, the population of Mayo increased from 110,713 in 1991 to 130,638 in 2011. According to figures in the 2006 National Census the religious demographic breakdown for County Mayo was 114,215 Roman Catholics, 2,476 Church of Ireland, 733 Muslims, 409 other Christians, 280 Presbyterians, 250 Orthodox Christians, 204 Methodists, 853 other stated religions, 3,267 no religion and 1,152 no stated religion. 9% of the population of County Mayo live in the Gaeltacht. The Gaeltacht Irish-speaking region in County Mayo is the third largest in Ireland with 10,886 inhabitants. Tourmakeady is the largest village in this area. All schools in the area use Irish as the language of instruction. Mayo has four gaelscoileanna in its four major towns, providing primary education to students through Irish. Mayo is well served by rail travel. Westport railway station is the terminus station on the Dublin to Westport Rail service. Railway stations are also located at Ballyhaunis, Claremorris, Castlebar, Manulla, Ballina and Foxford. All railway stations are located on the same railway line, with exception to Ballina and Foxford which requires passengers to change at Manulla Junction. There are currently four services each way every day on the line. There are also proposals to reopen the currently disused Western Railway Corridor connecting Limerick with Sligo. There are a number of national primary roads in the county including the N5 road connecting Westport with Dublin, the N17 road connecting the county with Galway and Sligo and the N26 road connecting Ballina with Dublin via the N5. There are a number of national secondary roads in the county also including the N58 road, N59 road, N60 road, N83 road & N84 road.There are plans in place for a new road running from northwest Westport to east Castlebar. The proposal is a type two dual carriageway with junctions at the N59, N84 and N60. Ireland West Airport Knock is an international airport located in the county. The name is derived from the nearby village of Knock. Recent years have seen the airport's passenger numbers grow to over 650,000 yearly with a number of UK and European destinations. August 2014 saw the airport have its busiest month on record with 102,774 passengers using the airport. Newspapers in County Mayo include the Mayo News, the Connaught Telegraph, the Connacht Tribune, Western People, and Mayo Advertiser, which is Mayo's only free newspaper. Mayo has its own online TV channel Mayo TV which was launched in 2011. It covers news and events from around the county and regularly broadcasts live to a worldwide audience. Local radio stations include "Erris FM",Community Radio Castlebar, Westport Community Radio and M.W.R. (Mid West Radio). The documentary Pipe Down, which won best feature documentary at the 2009 Waterford Film Festival, was made in Mayo. There is local resistance to Shell's decision to process raw gas from the Corrib gas field at an onshore terminal. In 2005, five local men were jailed for contempt of court after refusing to follow an Irish court order. Subsequent protests against the project led to the Shell to Sea and related campaigns. The Mayo Energy Audit 2009–2020 is an investigation into the implications of peak oil and subsequent fossil fuel depletion for a rural county in west of Ireland. The study draws together many different strands to examine current energy supply and demand within the area of study, and assesses these demands in the face of the challenges posed by the declining production of fossil fuels and expected disruptions to supply chains, and by long term economic recession. The Mayo GAA senior team last won the Sam Maguire Cup in 1951, when the team was captained by Seán Flanagan. The team's third title, this followed victories in 1936 and the previous year, 1950. Since 1951, the team have made numerous All-Ireland Final appearances (in 1989, twice in 1996, 1997, 2004, 2006, 2012, 2013, twice again in 2016 against Dublin, with their latest appearance coming in 2017 against Dublin, again), though the team have failed on all occasions to achieve victory over their opponents. The team's unofficial supporters club are Mayo Club '51, named after the last team who won the Sam Maguire. The county colours of Mayo GAA are traditionally green and red. The County's most popular association football teams are Westport United and Castlebar Celtic. Although Gaelic football and association football are the most popular sport in the county, other sports is popular in the county as well such as rugby, basketball and hurling. Richard Bourke, 6th Earl of Mayo (1822–1872) – Viceroy of India (1869–1872). Louis Brennan (1852–1932) – inventor. Admiral William Brown (1777–1857) – founder of the Argentine Navy. Margaret Burke Sheridan (1889–1958) – opera singer. Lucinda Creighton – former politician, leader and founder of Renua Ireland (2015–2016). 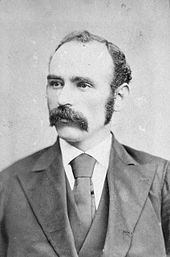 Michael Davitt (1846–1906) – Irish republican, agrarian campaigner, labour leader, Home Rule politician and Member of Parliament (MP) who founded the Irish National Land League. The bridge to Achill is named after him as well as Castlebar's local secondary school (Davitt College). Alan Dillon – former Gaelic footballer for Mayo (2003–2017). Seán Flanagan (1922–1993) – Fianna Fáil politician and Gaelic footballer. Served as Minister for Health (1966–1969) and Minister for Lands (1969–1973). Pádraig Flynn – former Fianna Fáil politician and Minister. Charles Haughey (1925–2006) – former Taoiseach of Ireland. William Joyce Sewell – Unionist colonel during American Civil War and US senator for New Jersey. Enda Kenny – politician, leader of Fine Gael (2002–2017), and Taoiseach (2011–2017). Tommy Langan (1921–1974) – Gaelic footballer, full-forward. Michael Neary – current Archbishop of Tuam. John MacHale (1789–1881) – Archbishop of Tuam, Irish independence leader. Ciarán McDonald – Gaelic football player. John McDonnell – athletics coach. He has won more national championships (42) than any coach in any sport in the history of American collegiate athletics. Ray Moylette – professional boxer. Cillian O'Connor – Gaelic footballer for Mayo. William O'Dwyer (1890– 1964) – 100th mayor of New York City (1946–1950). Pat Rabbitte – former leader of the Labour Party. Michael Ring – Fine Gael politician (inaugural Minister for Rural and Community Development (2017–present)). Mary Robinson – first female President of Ireland (1990–1997), and United Nations High Commissioner for Human rights. Aoibhinn Ní Shúilleabháin – winner of the 2005 Rose of Tralee contest. She is first Rose from County Mayo. Louis Walsh – entertainment manager and judge on British television talent show The X Factor and Ireland's Got Talent. ^ a b c "Census 2016 Sapmap Area: County Mayo". Central Statistics Office (Ireland). Retrieved 5 October 2018. ^ Corry, Eoghan (2005). The GAA Book of Lists. Hodder Headline Ireland. pp. 186–191. ^ Marine Institute Staff, (1996) Towards a Marine Policy for Ireland. Dublin, Ireland. Pp182. ^ "Analysis of the Potential Economic Benefits of Developing Ocean Energy in Ireland" (PDF). Sustainable Energy Authority of Ireland. August 2004. Retrieved 26 April 2013. ^ "Belmullet Wave Energy Test Site". Retrieved 26 April 2013. ^ "Ocean Energy Roadmap to 2050" (PDF). Sustainable Energy Authority of Ireland. October 2010. Retrieved 26 April 2013. ^ "2009 Local elections – Mayo County Council". ElectionsIreland.org. Retrieved 27 March 2011. ^ "Population and Actual and Percentage Change 2006 and 2011 by Electoral Division, Year and Statistic". Census 2011 Reports. Retrieved 26 April 2013. ^ From the latest E.I.S. submitted in June 2010 click 'Further Information'. then select 'Volume 2 of 3 Appendices Books 1-6' then select 'Volume 2 Book 3 of 6' where will be found eleven extensive tomes dealing with the wildlife, marine, freshwater and terrestrial flora and fauna of a small area of Kilcommon parish. ^ a b "Comhairle Contae Mhaigh Eo Archaeological Overview". Retrieved 2013-04-26. ^ Warren, Graeme (2009). "Belderrig: a 'New' Later Mesolithic and Neolithic Landscape in Northwest Ireland". In Finlay, Nyree; Sinéad, McCartan; Milner, Nicky; Wickham-Jones, Caroline. From Bann Flakes to Bushmills. Oxford: Oxbow. ISBN 978-1-84217-355-8. ^ Driscoll, Killian (2010). Understanding quartz technology in early prehistoric Ireland. ^ "Travel with us through the history of Ireland!". Retrieved 2013-04-26. ^ a b "County Mayo: An Outline History by Bernard O'Hara and Nollaig Ó'Muraíle". Retrieved 2013-04-26. ^ "Universität Duisburg-Essen: Language in Ireland". Retrieved 2013-04-26. ^ For 1653 and 1659 figures from Civil Survey Census of those years, Paper of Mr Hardinge to Royal Irish Academy 14 March 1865. ^ Lee, JJ (1981). "Pre-famine". In Goldstrom, J. M.; Clarkson, L. A. Irish Population, Economy, and Society: Essays in Honour of the Late K. H. Connell. Oxford, England: Clarendon Press. ^ Miller, Kerby A. (1985). Emigrants and exiles : Ireland and the Irish exodus to North America. New York: Oxford University Press. p. 293. ISBN 0195035941. OCLC 11814397. ^ "► N5 Westport to Turlough Road Project – Mayo National Roads Design Office". www.regdesign.com. Retrieved 2017-11-20. Wikivoyage has a travel guide for County Mayo. Wikisource has the text of the 1911 Encyclopædia Britannica article Mayo.